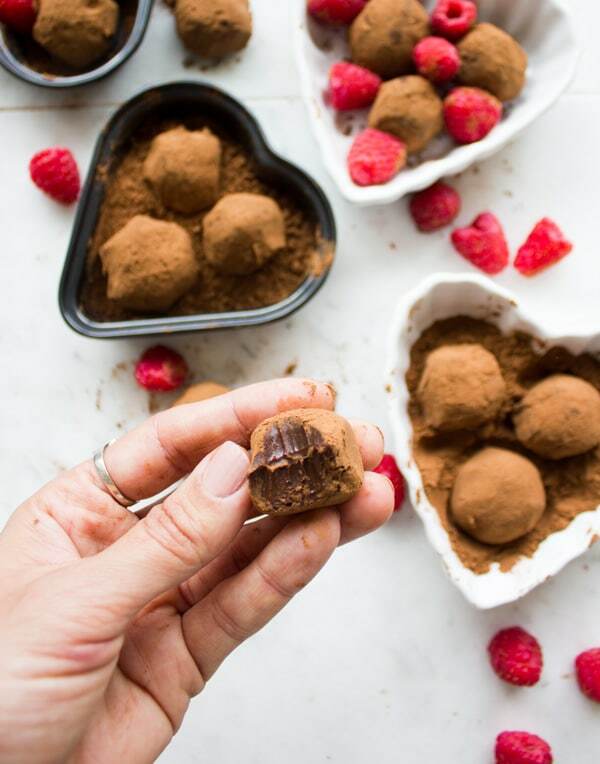 These easy chocolate truffles are made with just 2 base ingredients, and taste like pure chocolate lusciousness! 10 minutes is all you need to make these perfect edible holiday gifts. 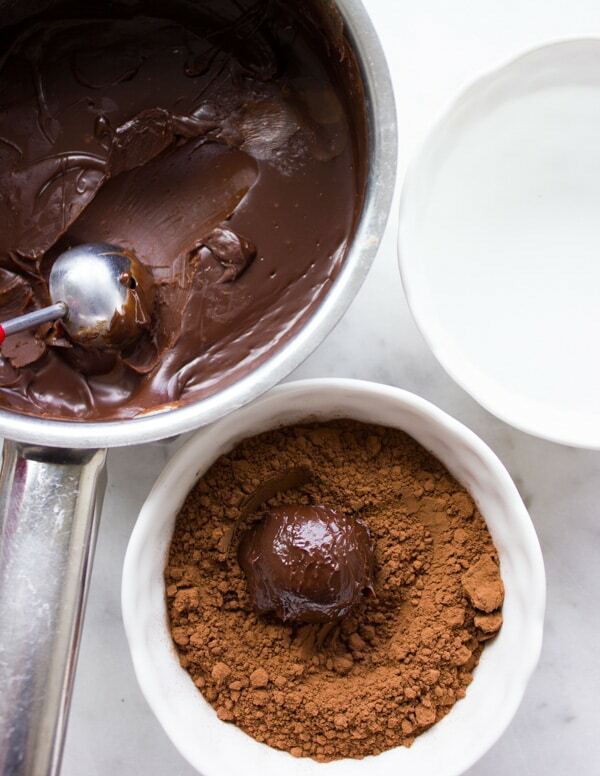 Here’s a luscious easy chocolate truffles recipe that’s absolutely divine. It’s one of the oldest classic French delicacies that can never be replaced. No matter how you watch your calories, you MUST leave room for just one of those chocolate truffles. Just one is all you need!! Whatever happened to those classic absolute LUSCIOUS divine French chocolate truffles?? Those melt in your mouth unbelievably smooth creamy chocolate-y tiny little things?? Yes, I know there are plenty of healthy versions of them now, aka. date truffles, which are made of dates, almond butter, and cocoa powder to start with and then flavored. Now don’t get me wrong. I have nothing against those healthy truffles, I make them once in a while. But the bottom line is, healthy truffles are one thing, and these dark chocolate truffles are something else. Imagine velvety smooth melt in your mouth chocolate. Imagine deep chocolate taste with ultra luscious creamy feel. Imagine PURE chocolate taste. And now imagine only 2 ingredients, no fussy technique and no baking needed. Seriously can you imagine all of that?!! So where’s the catch you may ask? Well, it’s not so much of a catch is you have nothing against cream. The truth is, you will never reach this velvety melt in your mouth texture without cream. And for the record, not much cream is used for this recipe, but its’ effect on the recipe is HUGE! If you’ve been around the blog for a bit and read this pan creamy mushroom tortellini recipe, you know that I only use cream when necessary! Only because I’ve figured out many ways around it and the Mr.absolutely despises it. However, no cream, no melt-in-your-mouth chocolate truffles, so for this recipe, I will gladly make an exception. So let’s get to it, here’s how two ingredients are used to their best! You’ll need to finely chop 2 chocolate bars. Alternatively, grate them after chilling in the fridge. In a pan or another bowl, you’re going to heat up the cream until it simmers. You can do this in the microwave and you can also use the stove. Then simply pour the chocolate chunks into the hot cream and whisk until smooth and the chocolate is completely melted, and ultra shiny. Pour on to that a tablespoon of hot brewed espresso (or coffee) for a richer chocolate taste, along with a pinch of salt. 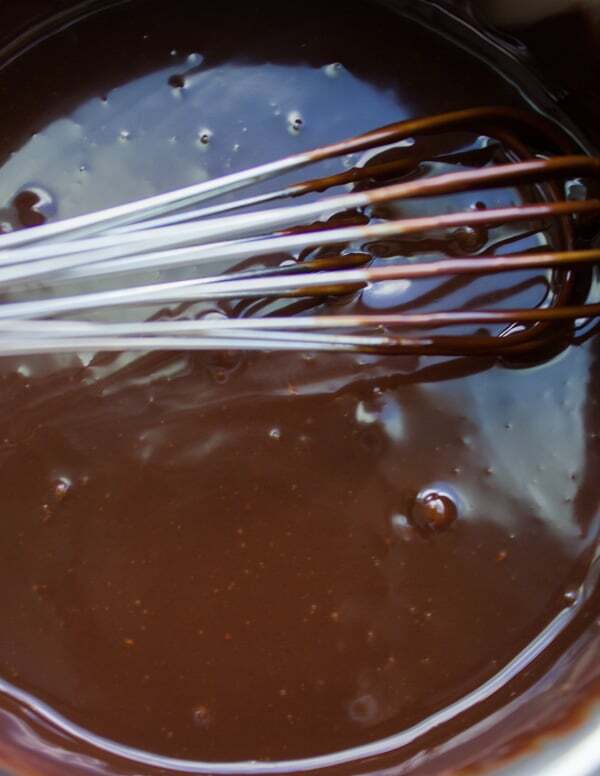 Give your chocolate ganache a final whisk. THAT’S IT ! All the work is done. This mixture gets covered and chilled for 1.5 hours. Then you’ll take a melon baller, a cup of hot water and a bowl of rich dark cocoa powder. Scoop up balls from the chocolate mixture using the melon baller and place each velvety chocolate ball in the cocoa powder to coat. Dip the melon baller in the hot water cup between each scoop so the chocolate mixture doesn’t stick to the melon baller. When all the mixture is done, its best to chill the truffles for just 10 mins or so. Or enjoy them right away!! 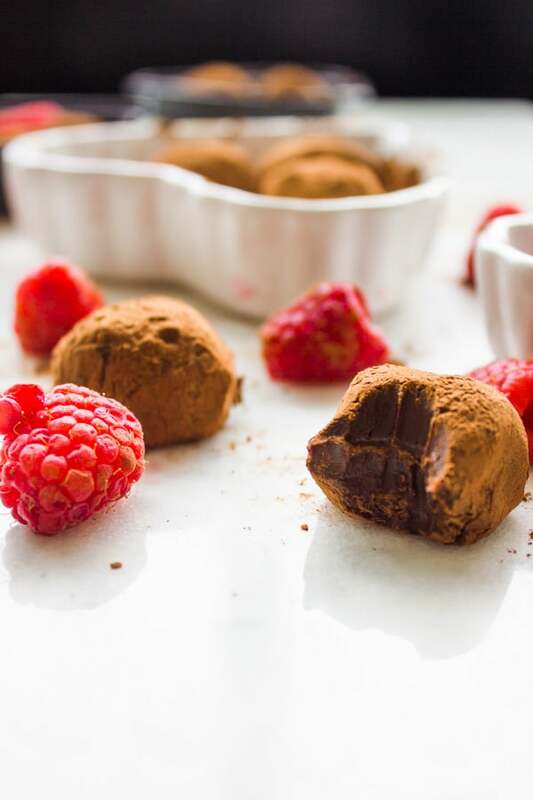 Now, these are the most basic, simple and yet decadent chocolate truffles you’ll ever make!! A long time ago when I used to live in Paris, those were the IT French truffles. But a few years ago when I went for a short visit, I found endless, and I mean endless variations of the truffles! 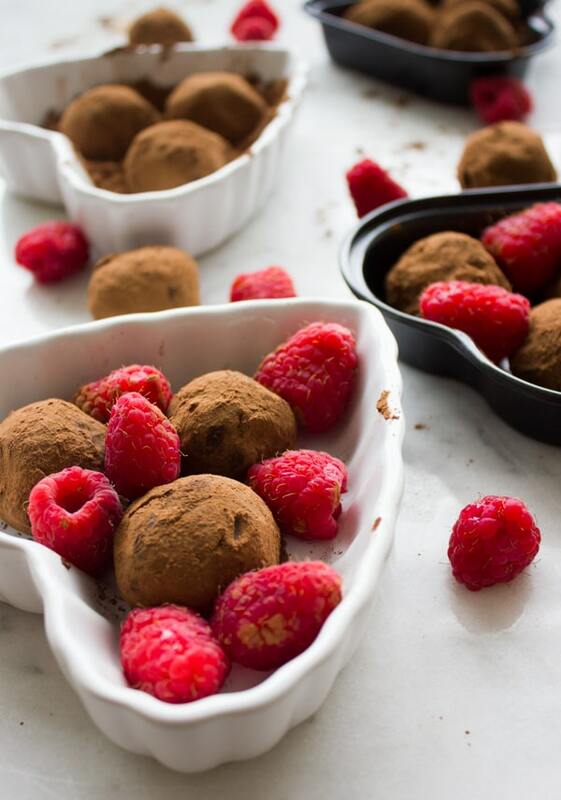 If you feel like jazzing things up, make different coatings to the truffles. Try ground nuts, shredded coconut, white chocolate, cranberries (or any dried fruit chopped up), a mixture of nuts and dried fruits, confectioner’s sugar, and many more options! Also if you’d like to flavor the chocolate truffles themselves, you can add orange zest to the cream mixture, some spice like chai spice, cinnamon, extra coffee, etc. These should be stored in a cool place, like in an airtight container in the fridge. Heat the whipping cream in a medium size pan over medium-low heat, covered with the lid until it starts to simmer—alternatively, you can place the cream in a microwave-safe bowl and microwave it for 1 minute until it simmers. Add the chocolate pieces into the cream and whisk them together until the chocolate melts and is shiny smooth. Cover up the truffle mixture with plastic wrap, and chill it for nearly 2 hours until it sets. 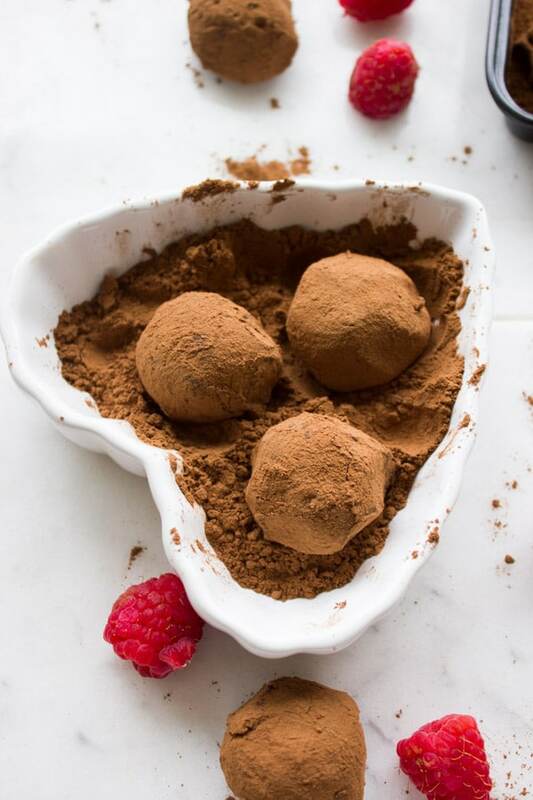 Use a melon baller, scoop up little balls of the truffle mixture and dump it right into a bowl of Cocoa powder. Roll the truffle in cocoa powder to evenly coat it. Repeat with the remaining mixture making sure to dip the melon baller in a cup of hot water between each scoop to avoid any truffle sticking. Chill the truffles or serve right away and enjoy!! Store the truffles in the fridge for up to 3 days. I was just thinking about making truffles this year and now it must be meant to be falling upon this recipe! These look rich and amazing! I would love to have a plate of these at a holiday party! I had a friend who used to make truffle; she owned a confectionery. I never thought I could even try to make them. However, she moved and I am thinking I need to give this one a try. I’ve never made truffles before but you certainly make me want to try. They look so doggone good and chocolatey. They would be beautiful in a nice gift box. We give food for presents and I know some chocolate lovers who’d love this. I have my own relationship with truffles 🙂 I always thought they were really hard to make and because of that never really tried. But your recipe is incredible! 2 ingredients and 10 minutes? 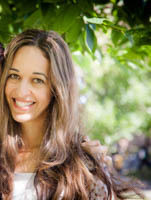 I am so excited to try it myself now – thank you so much for sharing this wonderful recipe! ? Sometimes you just have to go for the real thing. After reading this post I did. The truffles were fantastic and I have to say you’re right! They were very easy to make. I added that bit of espresso and the truffles were perfect. Thank you for a fantastic recipe. These looks rich and so delicious. I would love to have these ready on valentne’s day to enjoy with a big glass of full bodied red wine! 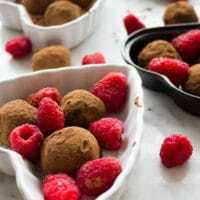 That is delicious chocolate truffles, I love this kind of simple treat we don’t need spend time in kitchen . I need to whip up some for the valentine. I can’t say no to chocolate. 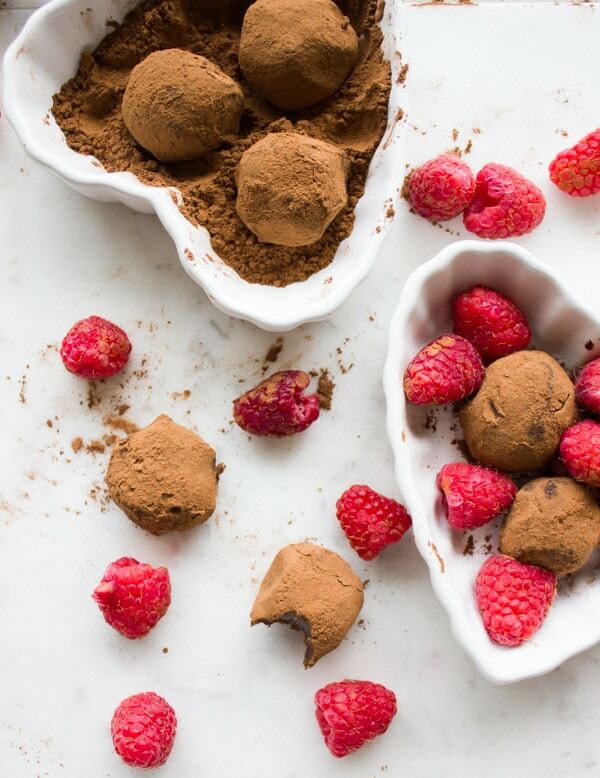 Especially to soft and flavorful chocolate truffles like these here. This recipe is so easy to make. It will be perfect for Valentine’s day.